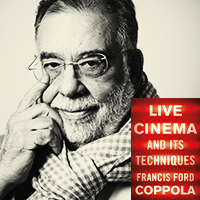 Literary Arts is honored to host Francis Ford Coppola, one of the most iconic filmmakers of our time, on Monday, October 2 to discuss his latest book Live Cinema and Its Techniques. Coppola will appear in conversation with The New York Times reporter Melena Ryzik. Tickets start at $15, available at Portland5.com. Francis Ford Coppola is an award-winning director, producer, and writer whose films include The Godfather Trilogy, Apocalypse Now, and The Conversation, among others. With more than five decades of experience in the film industry, Coppola has produced more than 50 motion pictures and earned six Oscars, including Best Director, Best Adapted Screenplay, and Best Picture. Coppola’s latest work includes the book Live Cinema and Its Techniques. Filled with lively anecdotes and invaluable lessons, the book offers an indispensable and entertaining guide to “live cinema,” a visionary new form of filmmaking. By weaving his vision of the cinematic medium with autobiographical and historical vignettes, Coppola convinces the reader that live cinema will transport filmmaking into a new era. Melena Ryzik has been a roving culture reporter for The New York Times for over a decade. Recent projects have included a broadly shared report on diversity and representation in Hollywood, an oral history of the activist group the Guerrilla Girls, and a series on socially conscious, genre-defying artists. As the awards season columnist known as the Carpetbagger, she has attended the Oscars five times and sent dispatches from film festivals around the world. A native Russian speaker, she has also served as a national correspondent in San Francisco and the mid-Atlantic states. Thank you to our event sponsors Angeli Law Group LLC, The New York Times, Oregon Film, The Oregonian, and Oregon Public Broadcasting.